EagleFiler - Программа, позволяющая собирать, организовывать и архивировать почту, веб-страницы, текстовые документы, изображения, PDF другие файлы из различных источников. Все файлы можно организовывать по папкам, добавлять к ним комментарии и заметки, прописывать тэги. А для безопасности всю эту библиотеку файлов можно зашифровать. EagleFiler позволяет создавать, проматривать и редактировать документы встроенными средствами, или с помощью сторонних утилит. 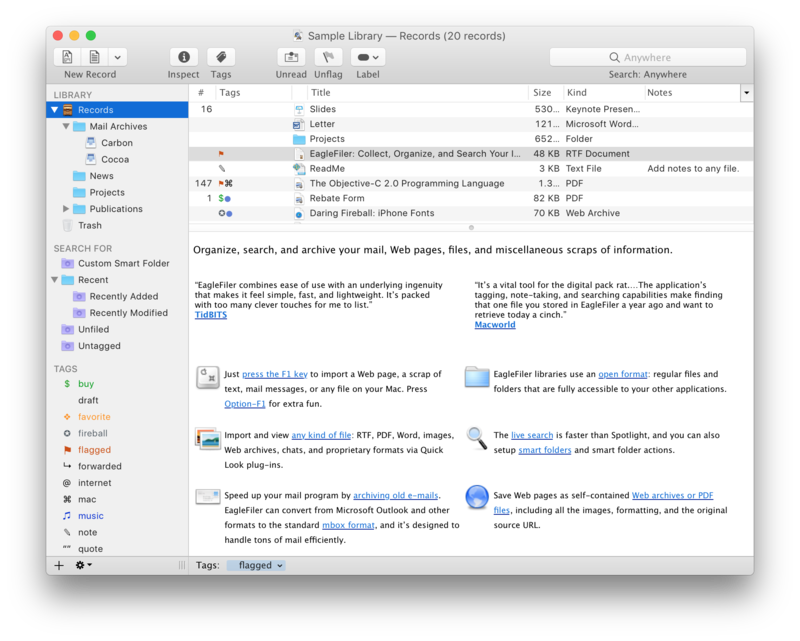 Работает с: Dropbox, Finder Tags, Fujitsu ScanSnap, Growl, Instapaper, iPhone/iPad, MailTags, OpenMeta, PDFpen OCR, Skim и др. EagleFiler - это наиболее гибкий инструмент на вашем компьютере. Improved the error message when EagleFiler is unable to launch. Worked around a bug where Outlook didn’t correctly report which messages were selected, leading to no messages being imported by the capture key. Worked around a macOS bug that could make setting a file’s creation or modification date to earlier than 1970 set the wrong date. Worked around a bug in macOS 10.14 that could cause a hang when importing a URL from Safari via drag and drop. Worked around a problem where EagleFiler could import metadata that was invalid Unicode and thus would cause an error when saving the database. Error logging works better with long error messages that exceed the macOS limit. Error logging now works with strings that cannot be converted to UTF-8. Fixed a bug where a Web page with an illegal Unicode byte sequence in the title might fail to import. Fixed a bug where toolbar buttons would shift position when a label changed size, e.g. from "Read" to "Unread". Fixed a bug where jаvascript in a Web archive could open a new window in your browser without any user interaction. Fixed a bug where the menu for hiding and showing table columns had an Import From iPhone item. Updated the screenshots in the manual.